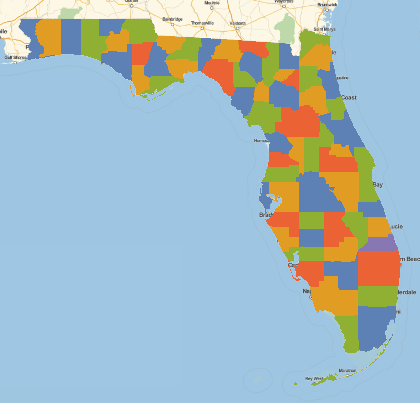 Apply four color theorem to the map of Florida? doesn't work when I evaluate it using my Mathematica software. I found an alternative way to get around this difficulty and I can apply the four color theorem to subareas of the map of Florida but, the same code that I use for the subareas will not work for the whole state. I have built the attached Mathematica notebook explaining my problem in detail. Thank you for your help! I am going to assume that in your solution you want a nested list of string values that represent the Counties with which you are interested. In that case, you will need to apply the EntityValue function to a valid Entity Data Types. However, you will first need to obtain an Entity Class from your strings that represent the Entity Types you seek. @Joel Gilly Thank you for responding to my query. I have no trouble getting the list of counties as you described. The trouble occurs when attempting to color the counties as described in another Mathematica notebook located at: http://community.wolfram.com/groups/-/m/t/1097057 Thank you for your help! @Aeyoss Antelope: Yes Aeyoss; that is indeed the example that I'm emulating; with counties in Florida instead of countries in Europe. Thank you. There's a 'quintipoint' in Florida, which breaks the ability to have a 4 color map. See here for more info: http://community.wolfram.com/groups/-/m/t/932548. Here's the code I used. Note how I manually tweaked the quintipoint. Interviewer: How would you make a four-color map of the counties of the state of Florida? Thank you Chris Hurst for your discussion about quintipoints and your incredible code to build the map of the USA. I wish I had read your posts before learning about quintipoints the hard way! And thank you Aeyoss Antelope for your wonderful sense of humor! Google (and other corporate) interviewees; beware about your "IQ" ; i.e., beware about the "Infamous Quintipoint" question! LOL. Here's a very compact solution using IGraph/M's IGVertexColoring function. IGVertexColoring[graph] returns a vertex colouring of graph. Currently this function does not guarantee a minimum colouring, but it does well here. You can see the fifth colour (purple) around the quintipoint in the South East.